My guest this week is an amazing yoga & crossfit instructor, cook, mom, wife, friend to my daughter, Bri …… and me :). Whenever I get to Portland to visit, I love it when Bri and I can have some Bonnie time in her yoga class. Seriously, the best! If you don’t follow her on Instagram @carrot_bowl_bonnie, you’re missing out because her posts are BOMB!! This pic was taken after an awesome yoga class. I have to admit, at first I was a bit star stuck with her because she really is so amazing. She is a beauty through and though. Just a sample of Bonnie’s Instagram posts. Not only are her pics brilliant, but the captions are inspirational. We all love our daily carrot_bowl_bonnie :),,,,,, and those arms—so rrrrrrrrripped!! 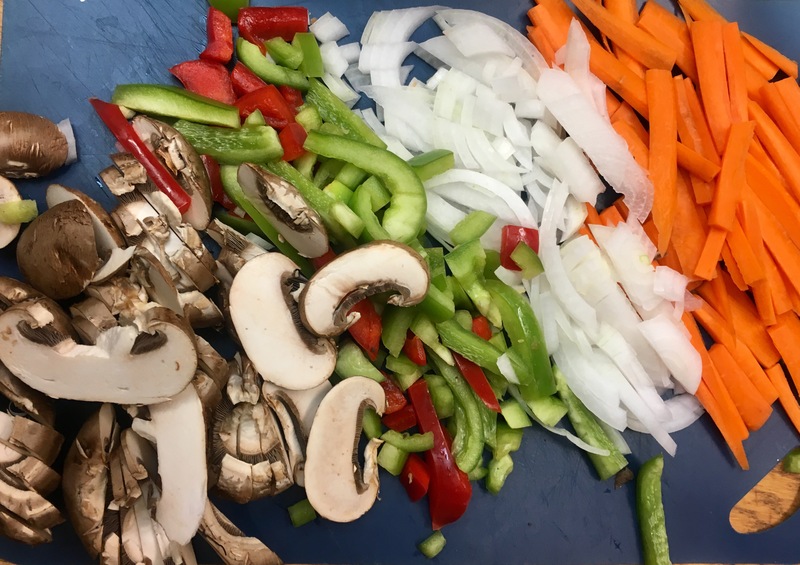 I can hardly wait to make this recipe she is sharing with us today! 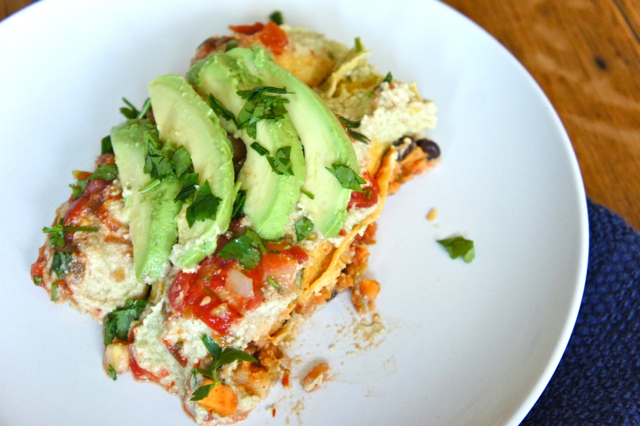 Vegan Cashew Cream Enchiladas!! Delish! Here’s Bonnie! I have more than 100 plants in my house. They make me happy. I just made a living plant wall and love it! I grew up in Montana and the sound of meadowlark’s singing in the field always made me feel at home. At our current home, the sound of robins and bullfrogs have replaced that. One summer when we were camping, we went to the local grocery store and my parents told me I could get whatever I wanted as a treat. I found the biggest tomato I’d EVER seen…I chose that over anything else. A couple years ago, I thought I wanted to be a food blogger. I could never do the splits as a child but can now in my mid-30’s. My favorite drink right now is Kevita, a probiotic drink like Kombucha, but less vinegar flavor. When I met my husband, Tyler, in college I immediately wrote him off because I thought he was too short. Apparently he tried to talk to me after that more times than I can recall. Woops! But his persistence paid off and I realized that he WAS taller than me and I actually liked him. I always thought my mom was the coolest because she was always in the middle of the fun. She always knew what was going on and knew how to be 100% who she was regardless of what anyone else thought of her. I’ve always loved to write poetry. When I began posting my yoga practice on instagram, I didn’t know it would become a place to begin writing again. Practicing yoga + writing changes my life daily. I think it’s amazing that there are things we continually find out about ourselves. I didn’t know I’d love yoga. I started practicing about 3 years ago. I hope that everyone finds some movement practice that reminds them of how powerful they are. Okay, let’s eat! If there’s something that makes me do a happy dance, it’s the perfect combo of good flavors. 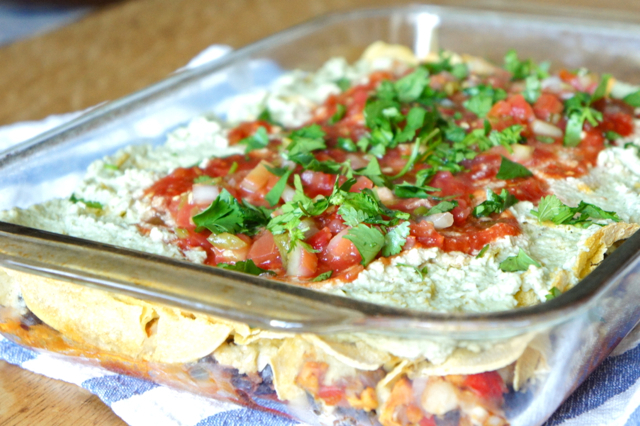 I love these enchiladas and think you will too! 1. In a bowl, cover the unsalted cashews with water. Let soak overnight OR 20 minutes (cover them with water, heat them in the microwave for 2 minutes, and let the food processor or blender run extra long to make them smooth). 2. Roast the pepper under the broiler for about 20 minutes. Pay attention until it starts to burn and blister. Remove from oven and immediately place in a covered bowl for 5 minutes. Take from the bowl and peel off the skin from the pepper. 3. 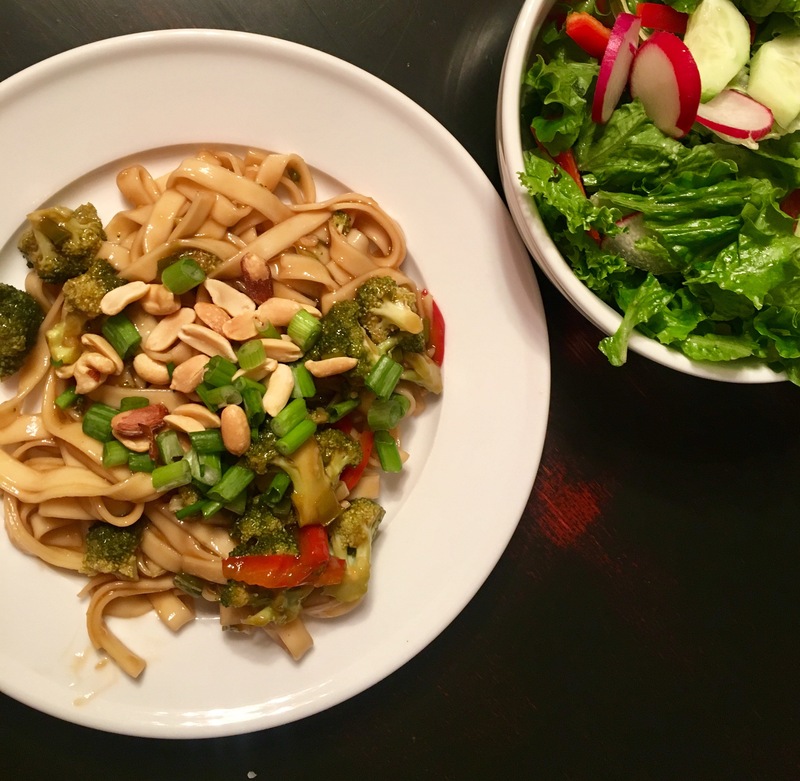 Place drained cashews, roasted pepper, water, garlic, onion, lemon juice, and salt in your food processor or high-speed blender and puree. Adjust seasonings as needed. 5. In a large pot, sauté onions, peppers, and sweet potato in olive oil until just soft. Add garlic and spices, cooking for another minute. Add corn, black beans, green chilies, and cilantro. Combine together. Adjust seasonings if needed. 6. In the bottom of a 9 x 13 pan, spread 1 cup of salsa. Take one corn tortilla, scoop some cashew cream onto it and top with a scoop of the filling. Fill the tortillas with as much as they can hold – no holding back. Roll carefully and place, folded side down, on top of the salsa. Repeat until all tortillas are used up. Place foil on top of pan and bake for 20 minutes. Remove foil and bake for another 5-10, just until you see the tortilla edges start to brown. Remove from oven, spread remaining cashew creme on top, layer with more salsa, and sprinkle with cilantro. Serve with avocado or guacamole. Preheat oven to 350 degrees. Lightly grease a 12 c. Bundt pan and set aside. 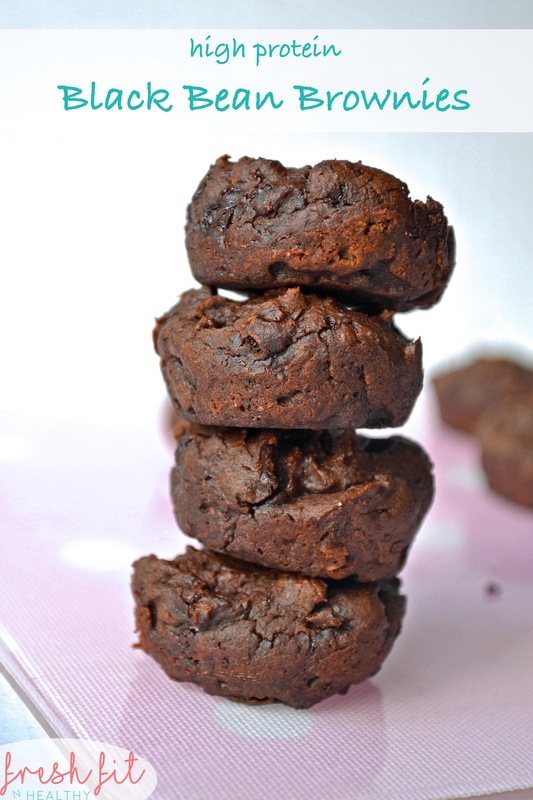 In a large bowl, sift together the flour, cocoa powder, baking powder, baking soda and salt. Mix in the sugar. Make a well in the center and add the applesauce, milk, pumpkin, and vanilla. 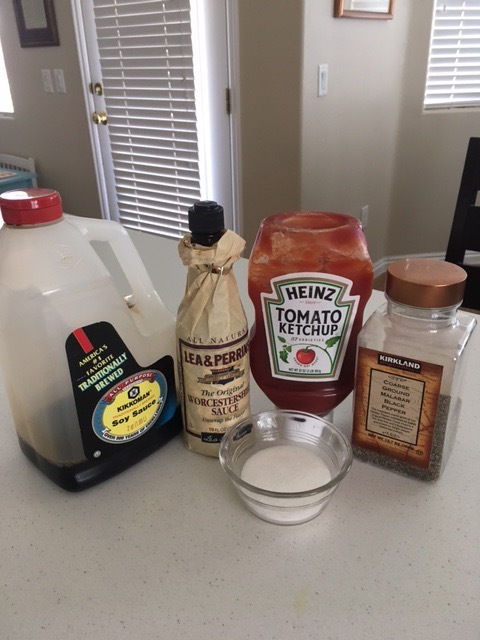 Use a whisk to mix the wet ingredients together in the well and then incorporate the wet and dry ingredients until well combined. Add chocolate chips. Fold in the zucchini. Check consistacy and if batter is too thick add a little more milk. Pour into the prepared pan. Bake for about 60 min (a butter knife inserted into the center should come out clean). Let cool for 10 min or so, then invert it onto a cooling rack to let cool completely. *original recipe called for 3/4 c. Almond milk and 1/2 c. Canola oil. Addition of chocolate chips was ours :). It’s yummy! Bring the almond milk to a roaring boil in a small saucepan. Add the maple syrup. Turn off the heat and whisk in the chocolate chips until totally melted and smooth. Place the cooling rack over the sink so that excess ganache falls into the sink and not all over the counter. As you can see, we just poured ours over the cake and let it pool in the middle. Yum!. Let it set before slicing and serving. This girl knows how to bake! FRIEND FRIDAY GUEST—MY SISTER, EVON SEELY!! The Rose Family :). First pic is of our brother, Bruce, who was killed by a drunk driver at the young age of 24. It was heartbreaking for our family. I was just 8 years of age at that time and he left behind a wife and baby girl. 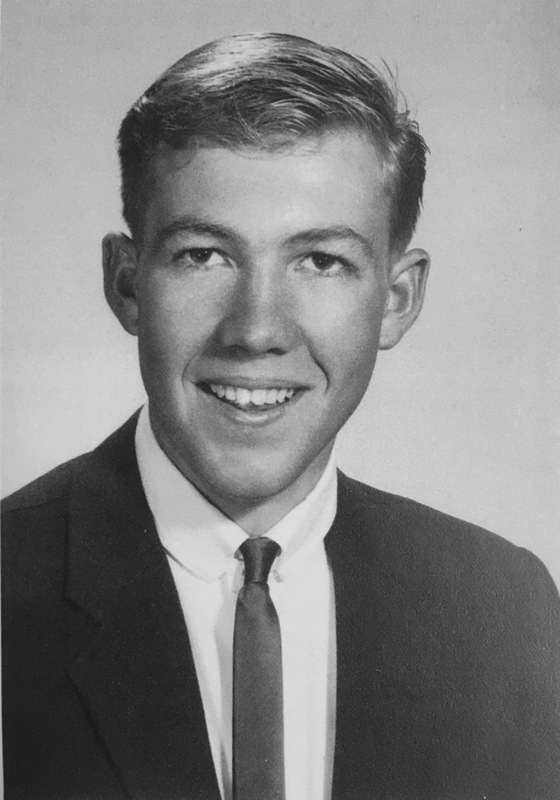 My other brother, Larry, was on a mission for The Church of Jesus Christ of Latter Day Saints at the time and Evon was due with her firstborn. 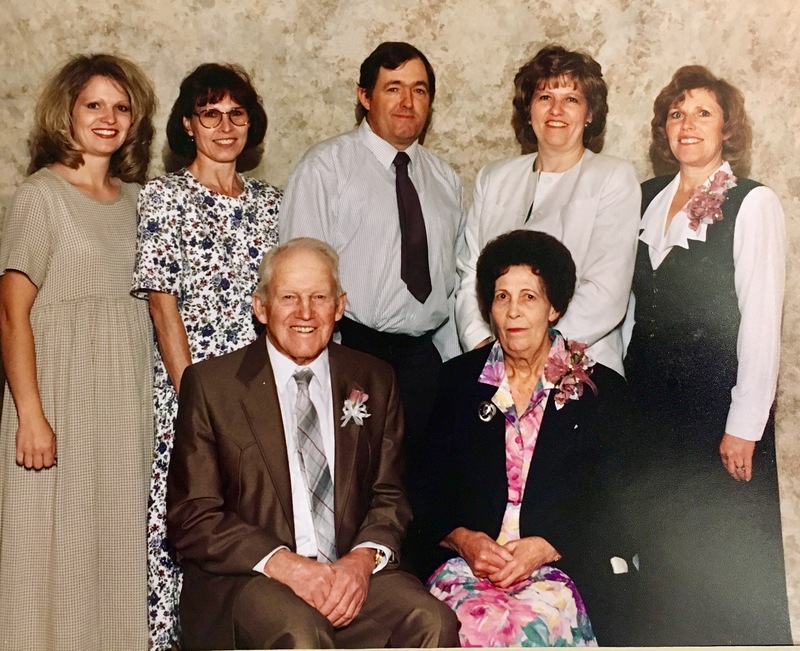 The second pic is an older pic—me (enormously pregnant with our 4th child), Evon, Larry, Janis, Joanne (front) our dear dad and mom. Evon lives about 6 miles from me. She has always been there for me through hard times and good times. One of the memories that touches my heart was when my husband was going to chemo and my 5 children were young, she would drop everything and watch my sweet little darlings so I could be with my DH when he was so terribly sick. She is just that kind of person to everyone. I’m so grateful to have her in my life and so grateful for family. As Princess Diana said, “Family is the most important thing in the world.” And with that, I bring you my sister, Evon!❤️ Isn’t her family so beautiful!! I am excited to contribute to Peg’s blog. When I was a teenager, I was driving my mom over to Panguitch quite frequently. At last, she asked me if I knew why we were going there so much. I told her no. She then told me that we were going to have a baby. I was so elated and excited! I told her that was great news as I had been praying for a little sister. Mom was about 41 years old at that time and wasn’t overly excited about the event. Peg is the baby of our family and has been adored and loved by her parents and all five of her older siblings. We have wonderful memories of her as she was growing up. She was such a blessing to our family. In fact, our Dad didn’t want “that dentist” to steal away his little Peg! Nevertheless, Peg and Dane did get married and Mom and Dad grew to love him very much too! When Peg and Dane had children, we were so excited about them! We have many fun and special memories of them. Particularly, I remember the fun the kids had on Princess (the horse) and the day she ran away with Brianne and Nat; then Brance telling me he didn’t know I could run so fast! I love the photo of Brianne, Nat, McKelle and Brance on Princess. When they were little they also liked to run in circles on the blue living room rug. Hilarious! We enjoyed having the kids at our Santa Clara house jumping on the trampoline with their cousins. It was so cute when Caden became confused because his siblings called me aunt and our grandchildren called me grandma, so his name for me was “Aunt Grandma”. I loved tending the children when Peg and Dane went to dental conventions. We would have the grandest times! We have so many precious memories! 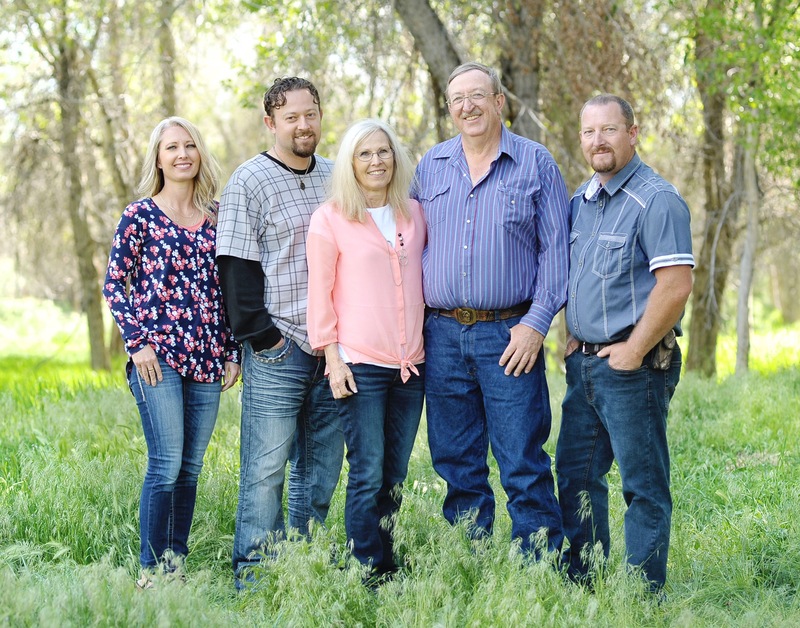 We dearly love Peg and Dane and their delightful family! Now, about the recipes . . . Most of my life I have suffered with stomach troubles. Finally, in 2014 I had a colonoscopy-endoscopy and found out that I had celiac disease and some of the complications that are caused by that disease. 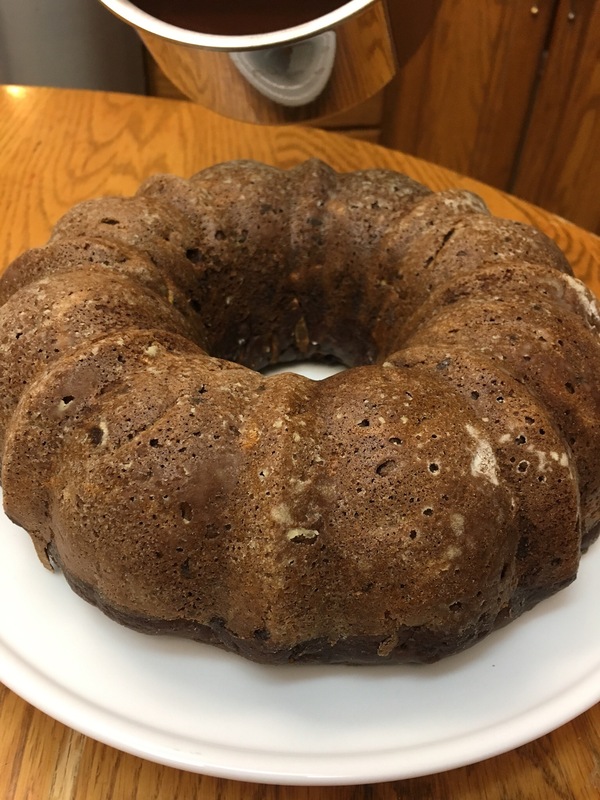 After learning more about it, I had to give up some of my favorite treats and thought I would never be able to enjoy licorice, breads, cinnamon rolls, etc. After trying some of the expensive (tasteless) commercial treats I decided that I needed to learn how to bake some of them myself. I purchased the book, Gluten-Free Family Favorites by Kelli and Peter Bronski. I liked their Artisan flour mix because it had more grains in it than some of the other mixes and the recipes had less fats. Combine all ingredients and whisk well to mix thoroughly. Store in an airtight container for up to 3 months in the pantry or 6 months in the refrigerator. 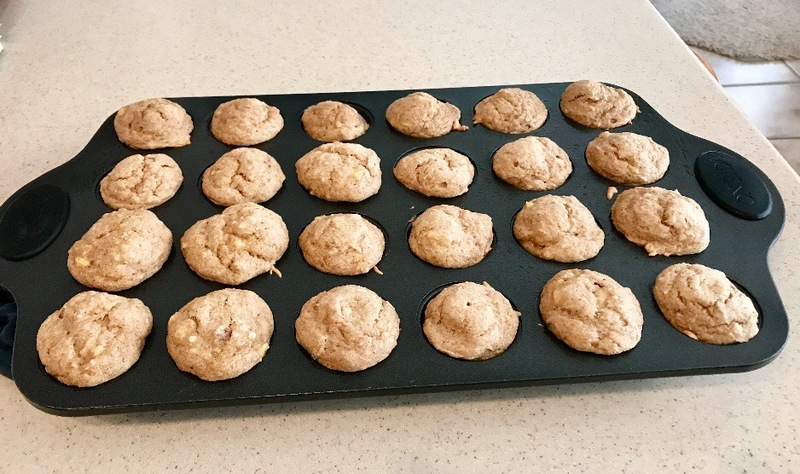 One of my favorite recipes to make with it is Banana Mini Muffins. 1. Preheat the oven to 350 degrees F. Grease the cups of a 24-cup mini muffin tin with butter or nonstick cooking spray. Place paper liners in the greased muffin cups, if desired. 2. Mash the bananas in a large bowl until mostly smooth with a few large lumps. Mix in the egg, honey, applesauce and vanilla. 3. In a separate bowl, combine the flour, xanthan gum, baking powder, baking soda, salt, and cinnamon, whisking to mix well. Add the dry ingredients to the banana mixture and mix at low speed just until combined, 5 – 10 seconds. Scrape down the sides of the bowl and mix at high speed for about 5 seconds, until the batter is thoroughly mixed. 4. Scoop the batter into the prepared muffin cups. A cookie scoop works very well to transfer the batter. Bake for 15 to 18 minutes, until the muffins spring back when lightly touched and a toothpick comes out clean. The muffins should be slightly golden brown on top. 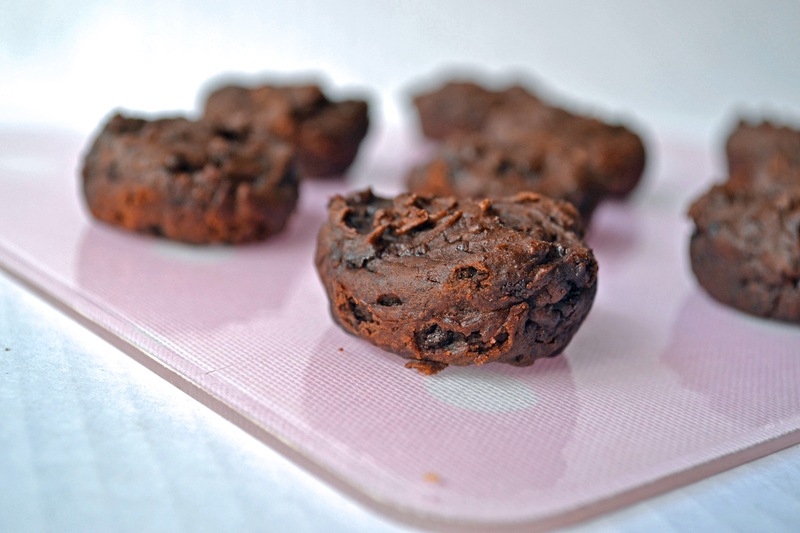 Let muffins cool in the tin for 5 minutes, then remove and serve. Me talking again :)— YUM!!!!! Thanks for sharing with us today, Evon! Love you! This recipe is definitely a keeper! Enjoy :). Prep Time: 15 min. Cook Time: 15 min. Total Time: 30 min. Start boiling the water for the lo mein and cook according to package instructions. 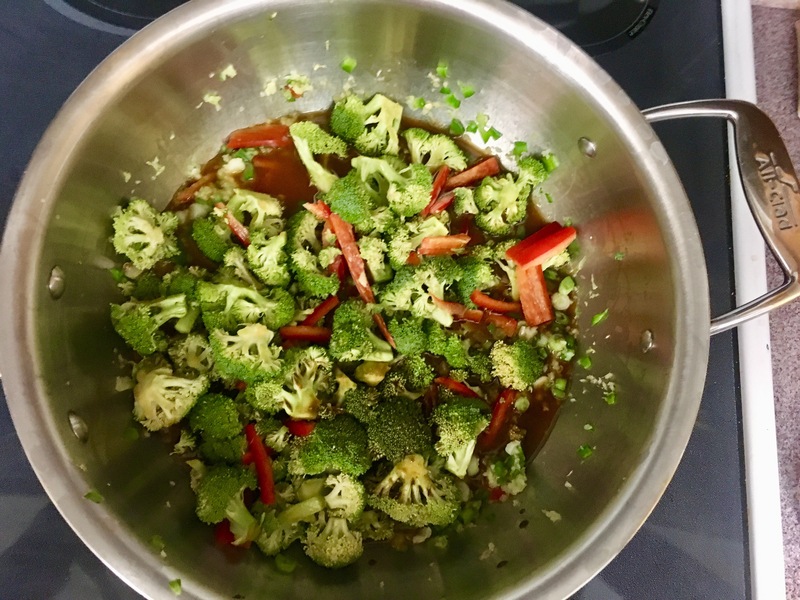 Make a marinade for the broccoli and red pepper. In a shallow mixing bowl, whisk together the soy sauce, rice wine vinegar, water, agave and corn starch until fully combined and the corn starch has dissolved. Now add the broccoli to the bowl. 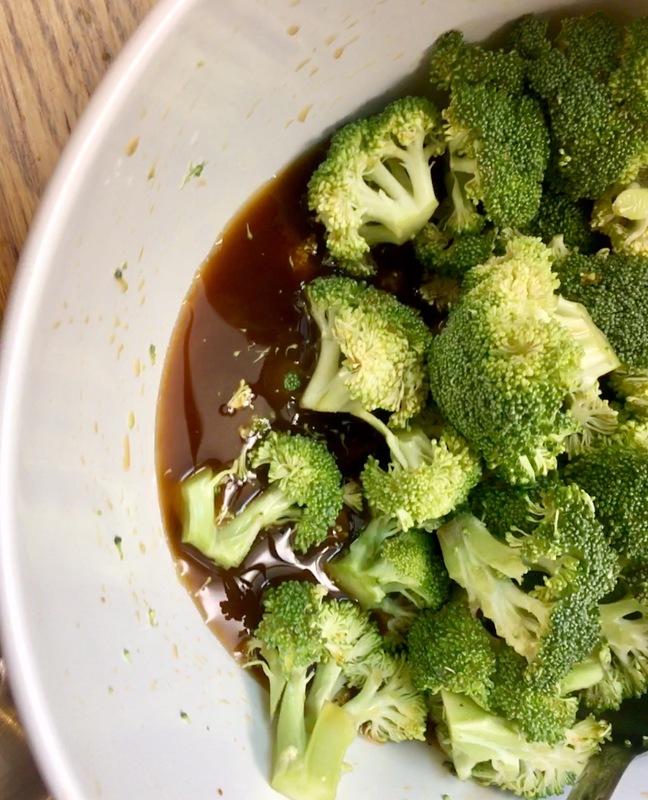 Stir to coat and make sure the broccoli is fully covered by the marinade. Set aside to marinate for about 5 minutes or so. Stirring every minute or so. Now in a wok or large non stick skillet, heat the sesame oil on medium high. 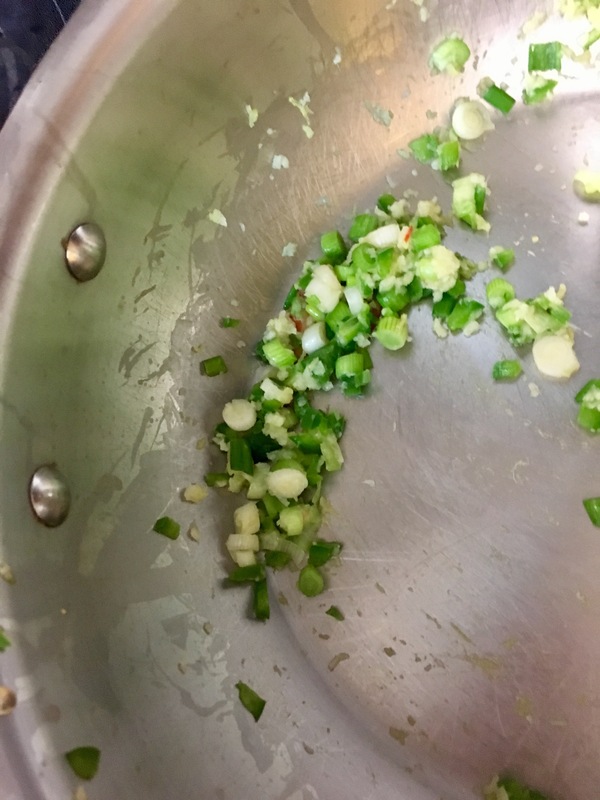 Add the green onions, garlic, ginger, and chilies. Saute for 1-2 minutes, until the garlic and ginger are soft. Reducing heat as needed. 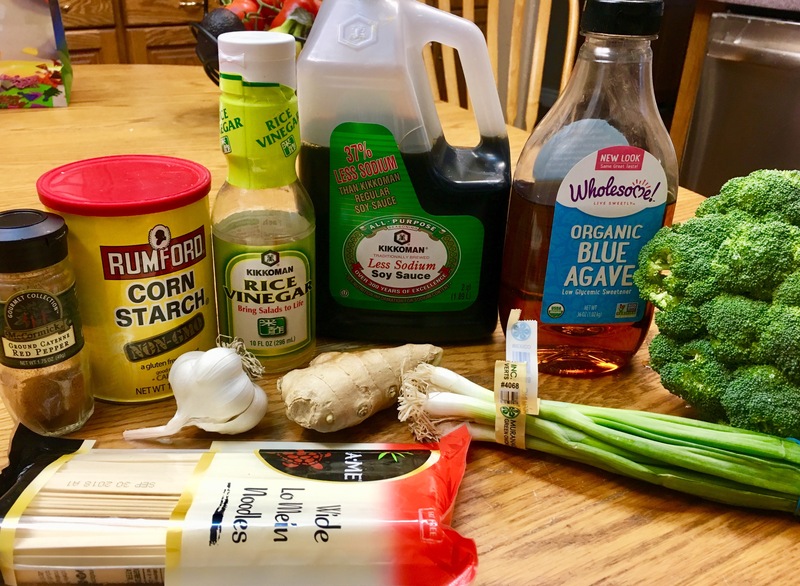 Now add the broccoli and the marinade to the wok or skillet. Saute until the sauce has thickened. 1-3 minutes. Now add the hoisin sauce and half the peanuts. Toss together. 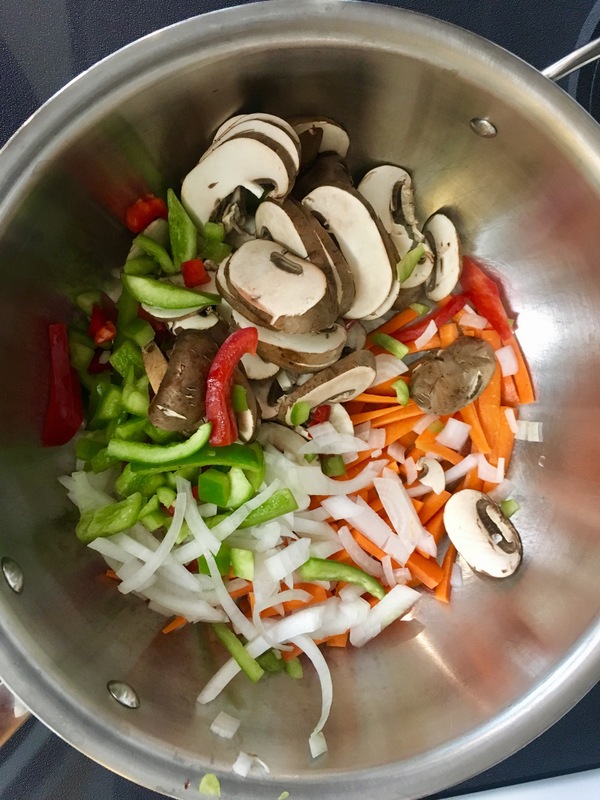 Once the lo mein noodles are done, drain and add to the wok. Toss the noodles to coat with sauce. 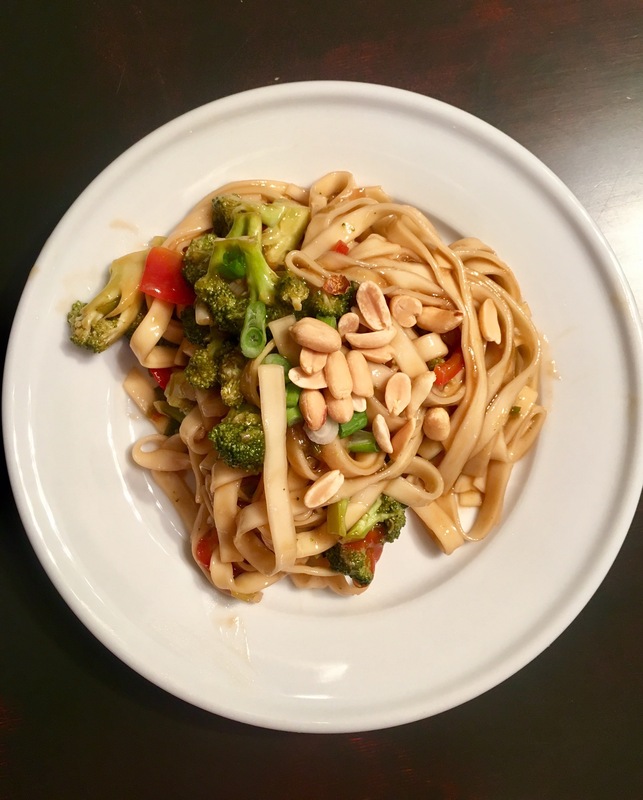 Serve immediately topped with the remaining peanuts and more chopped green onions. Sarah Grace, Founder of Fresh Fit N Healthy, author of the book Chasing Freedom, a Certified Personal Trainer, Registered Dietitian with a MS in Exercise Physiology, ex-D1 athlete, both a UF and FSU alumni, and simply a young entrepreneurial woman that loves living a healthy lifestyle – mind body and soul. Currently she works physically as the sports dietitian for Titus Sports Academy in Tallahassee FL, simultaneously running her own business online, coaching incredible men and women all over the world to help them become their best. Through her business Fresh Fit n Healthy, she privately works with clients in creating unique and effective fitness & nutrition plans, offering online courses and webinars, meanwhile daily sharing free content on her blog, Instagram, and youtube channel to help people rediscover what living healthy truly means in a diet-focused world. Sarah Grace’s book, Chasing Freedom, focuses on her story of overcoming her eating disorder and finding freedom. Her focus is on helping you reach your goals in a long-lasting way, without strict dieting. 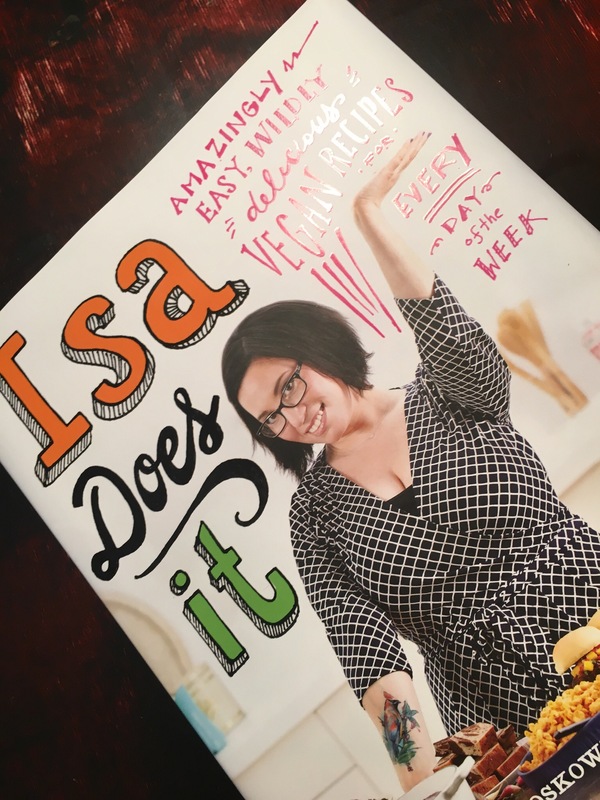 She is a big believer that nutrition is not one-size-fits-all, and in combining science with what makes you as an individual feel best. Healthy living should be freeing and fun, and that’s the lifestyle she is here to help you discover. If you are an individual and wanting to work with Sarah Grace in creating a personalized nutrition/fitness plan, focused on mindset – nutrition – and fitness – head to this website here! Place black beans, melted butter, eggs and honey in blender or food processor and blend until smooth and beans are pureed. Add in all other ingredients except for chocolate chips and blend again. Bake for about 10-15 minutes, or until done in the middle. It’s better to under-bake then over-bake, as over-baking will lead to a dry product, and under-baked will just be rich and fudgy! This weekend I was craving pumpkin. I LOVE pumpkin bread, pumpkin cookies, pumpkin pancakes. Well, you get the idea :). 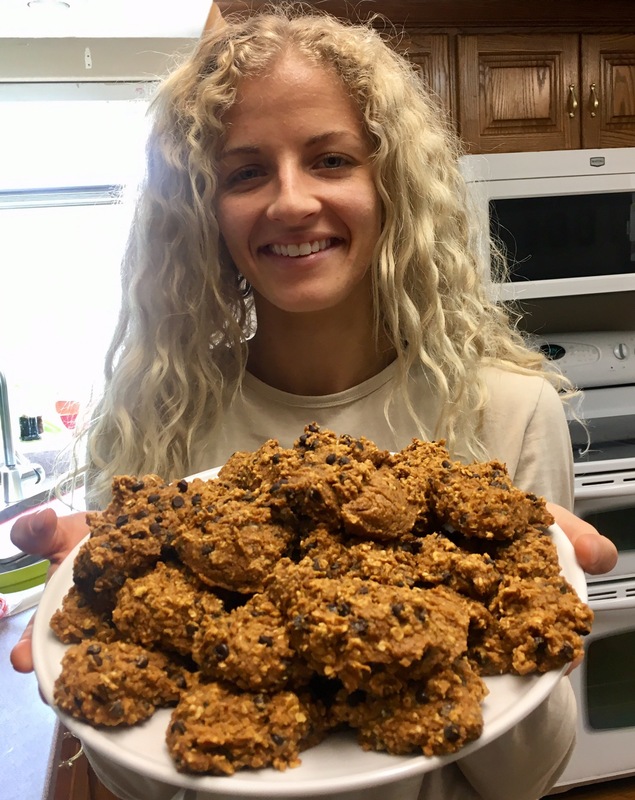 My daughter, Natalie, was home this weekend and we went to work transforming a regular pumpkin cookie recipe to a more healthy version. 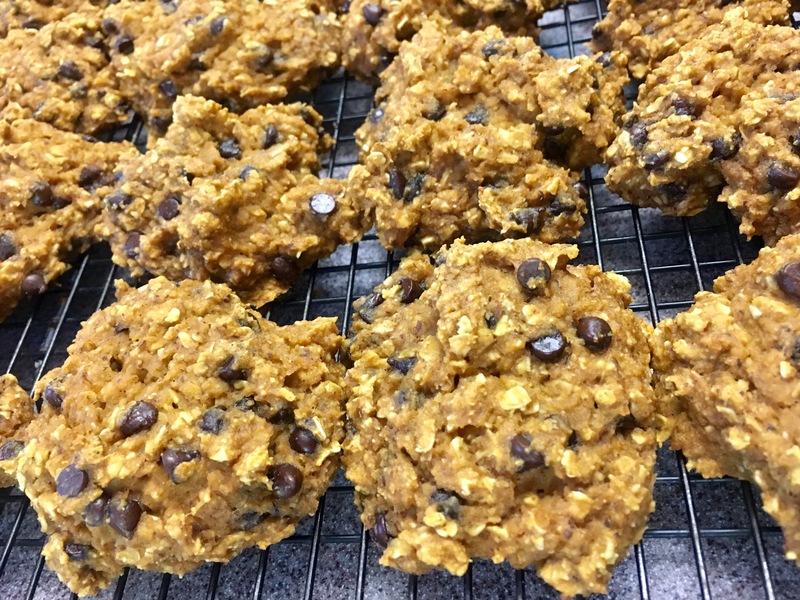 The original pumpkin cookie recipe is bomb. Here it is just in case you want to make it :). Mix first 5 ingredients together (wet ingredients) and the dry ingredients in another bowl. Gradually add the dry ingredients to the wet and add chocolate chips and nuts at the last. Bake at 350 degrees for 12-15 min depending on how big your cookies are. These are so delicious! BUT they have butter, white flour, eggs and a lot of sugar. Here’s the updated healthier version :). Mix first 6 ingredients and add remaining. Bake at 350 for 13-15 minutes on cookie sheet. Enjoy! These are best the following day after you bake them. Seriously, so good! FRIEND FRIDAY GUEST POST—SUMIKO MONSON!! My Friend Friday Guest today is one of my dear friends, Sumiko Monson!! If you talk to anyone about this dear friend, they will all tell you that “Sumiko, is the sweetest! I love her!” She has the most sweet, pure heart and is a great example of Christ-like service. She and her family have been dear friends of ours for about 17 years and we LOVE the Monson family!! Sumiko is such an amazing little chef and each time we eat a meal in her home, we come away lifted up in spirit and our bellies are full with the most delicious Japanese food. She is seriously a gem! Just look at this awesome family! 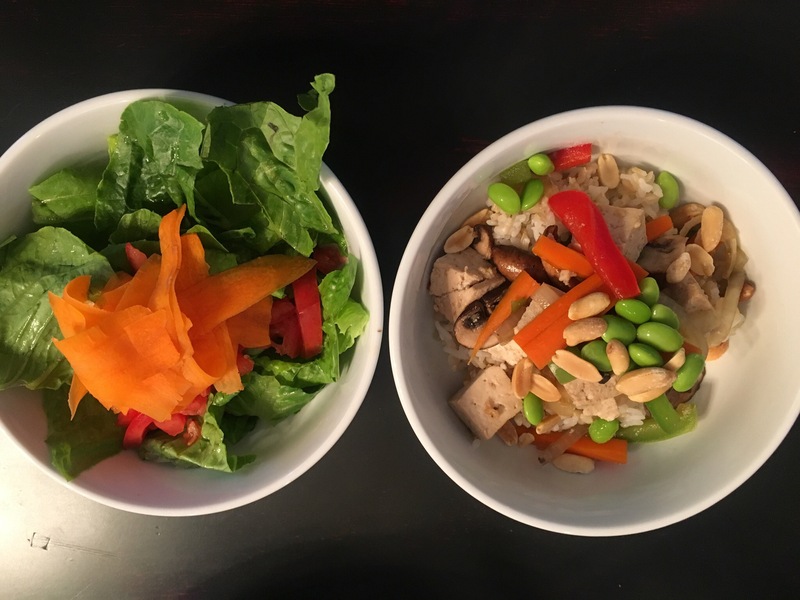 Sumiko is sharing with us today a couple of recipes that are some of our favs! Here’s Sumiko……. My name is Sumiko Monson. I grew up in Japan and moved to Hawaii to attend Brigham Young University Hawaii, and met my husband while working at the Polynesian cultural center where we worked as Japanese tour guides. He is a blessing from Heavenly Father and I love him dearly!! We lived in Oahu and Maui for 16 years and Tokyo for 4 years before moving to St. George, Utah. For the first 18 years of my life, I lived to play sports, namely basketball, tennis, track and swimming. But marathon is whole another level of intense dedication and endurance. I have much respect for Peggy and her fellow runners! My husband and I have 5 grown children and the first 3 are married to amazing spouses, the other two are in college. We have 7 precious grandchildren who melt our hearts. Going on vacation with them is my favorite thing to do. I first met Peggy in our church nursery room where her Caden and my Casey attended 15 plus years ago. And when she told me that her husband served his LDS mission in Japan, they took special place in my heart J. She is a super lady who can do anything and everything but is still humble and sweet. I am blessed to have her as my friend! 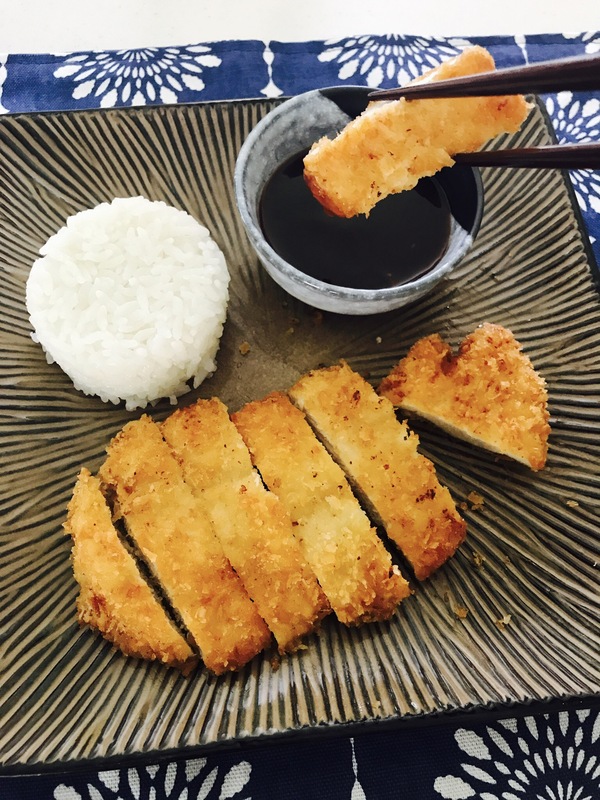 The Chicken Katsu and Butter Mochi recipes I posted here are my children’s all time favorites! They are Japanese influenced and very popular in Hawaii. Pat chicken with paper towel. Dredge thin sliced chicken in flour, dip in eggs, and coat with panko. In electric skillet, heat oil to 375F. Fry chicken until golden brown; drain on paper towels. Cut into 1 inch strips. Serve with Katsu Sauce. Makes 6 servings. * I slice chicken in half, horizontally, to make each piece thin. Preheat oven to 350F. In a large bowl, combine mochiko, sugar, and baking powder. Add remaining ingredients to mochiko mixture and mix well. Pour into a 13 x 9 x 2 inch pan. Bake for 1 hour; cool. I cut mine into 1 x 2 inch small rectangle pieces. This recipe was a keeper! 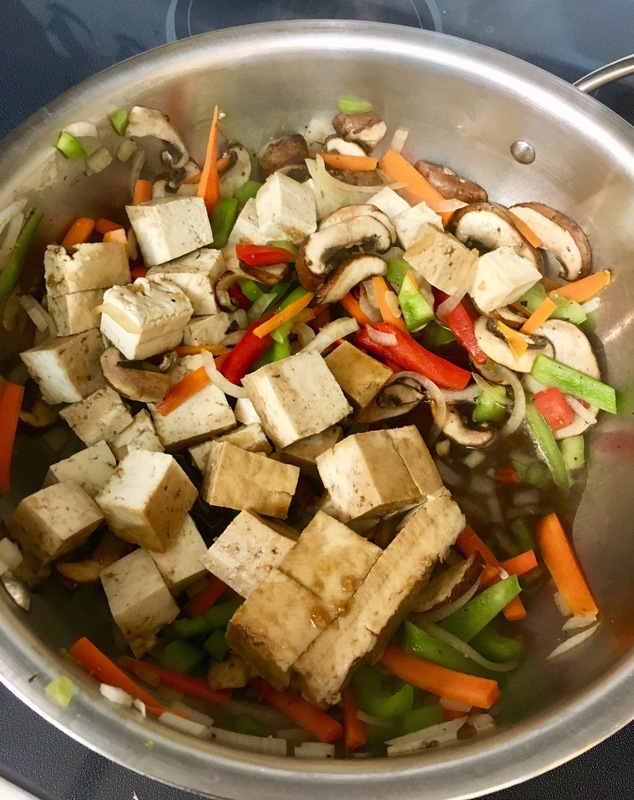 We have eaten tofu for years, but now we are eating more and it’s a great source of protein for us since we have gone plant based. I used brown and white rice cooked together, but you can also use quinoa, either works great. I prefer rice with teriyaki. Mix teriyaki marinade together and gently toss over cut up tofu. Set aside. Sauté the onion, peppers, carrots. Salt and pepper. Cook for approx. 7 minutes or until tender. Instead of using oil, I sautéed the veggies just a few min then added a tiny bit of water so they wouldn’t burn. It works great and much healthier. Add tofu and teriyaki sauce to veggies. Cook approx. 5-7 min or until tofu is heated through. And that’s it! So quick and so easy!